Enjoying iTunes videos with 5.1 audio or AC3 audio track at your home cinema will be a really fantastic experience. However, iTunes videos are protected by DRM and it causes one problem, that is, these iTunes videos can't be played on other devices except for Apple devices. Even though there are some iTunes movie removal software on the market that can help strip DRM and convert to DRM-free videos, but until now, none of them could keep the AC3 audio track after conversion. This puzzles a lot. How to remove the DRM to get the unprotected videos while keeping the original 5.1 surrounding audio? Any solution? M4Vgear DRM Media Converter is the fastest DRM remover in the world which can remove DRM from iTunes videos at 20X faster speed and at the same time, keep 5.1 audio of iTunes videos. 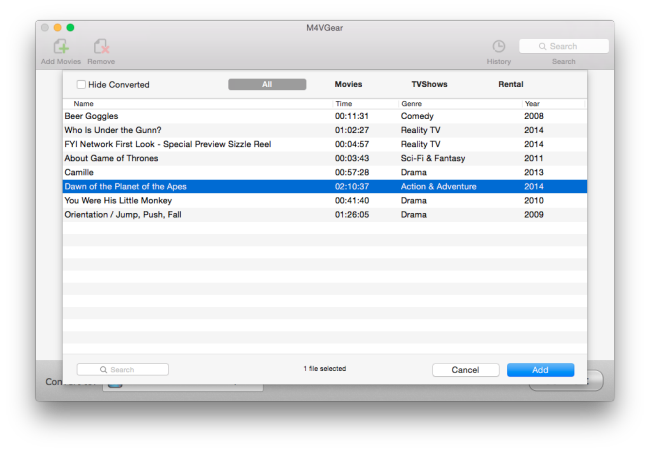 After converting with M4VGear, you will get DRM-free iTunes videos with 5.1 audio, subtitle and lossless quality. Let us see how to keep 5.1 audio when removing DRM from iTunes videos below. Note: M4VGear for Mac and Windows keep 5.1 audio track by default when choosing "Same as source for MP4" or "Same as source for MOV" as output format for conversion. 1: Launch M4VGear and iTunes will be opened automatically. 2: Click "Add Movies" button on the upper left to choose iTunes videos from iTunes library and then click "Add" to apply. 3: Click the Audio setting option on the loaded video to choose audio track you want to save. You can choose to save All Audio that includes stereo and AC3 5.1 audio or only 5.1 audio. 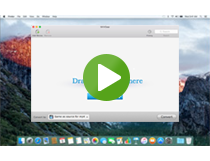 4: Click "Convert" button on the bottom right to start removing DRM from iTunes videos. After the conversion is finished (M4VGear leads 20X faster conversion speed), open output directory to find the DRM-free MP4 videos with 5.1 audio in MP4 format. Now you can stream these videos with 5.1 audio with Apple TV or play them on QuickTime Player. Note: You can also open the converted video by clicking "History" on the top right of M4VGear program interface. To get AC3 5.1 audio after converted by M4VGear, please be sure that your original iTunes video contains the ac-3 audio track. 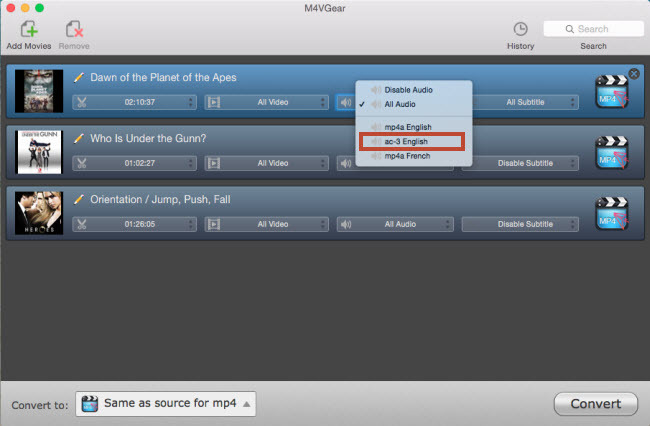 Tips: M4VGear will offer you a 1 minute free trial which lets you convert one minute of iTunes video for free. If you want to unlock the time limitation, please purchase M4VGear. The price now is $44.95, decreasing from original $49.95 by $5. Dolby Digital, or AC3 Audio is the common version of Dolby Digital technology containing up to six discrete channels of sound. The most elaborate mode in common use involves five channels for normal-range speakers (20 Hz – 20,000 Hz) (right, center, left, right surround, left surround) and one channel (20 Hz – 120 Hz allotted audio) for the subwoofer driven low-frequency effects. Mono and stereo modes are also supported. The above mentioned five full bandwidth channels and one low-frequency effects channel (the "point one") make up 5.1 audio, which is the most popular audio system in commercial cinemas and home theaters. Dolby Digital, SDDS, DTS, and Pro Logic II all use 5.1 audio system. Besides, 5.1 is also the standard surround sound audio component of digital broadcast and music. Go to M4VGear download center or store to get your iTunes movie converted with 5.1 audio track retained and for freely playback. How to Convert iTunes M4V Fomat to MP4? How to Mirror iTunes Videos to TV with a Roku?